It is surprising that little is known of a town as pretty as Jukkasjarvi. However, I am sure that plenty of people have heard of the Ice Hotel. 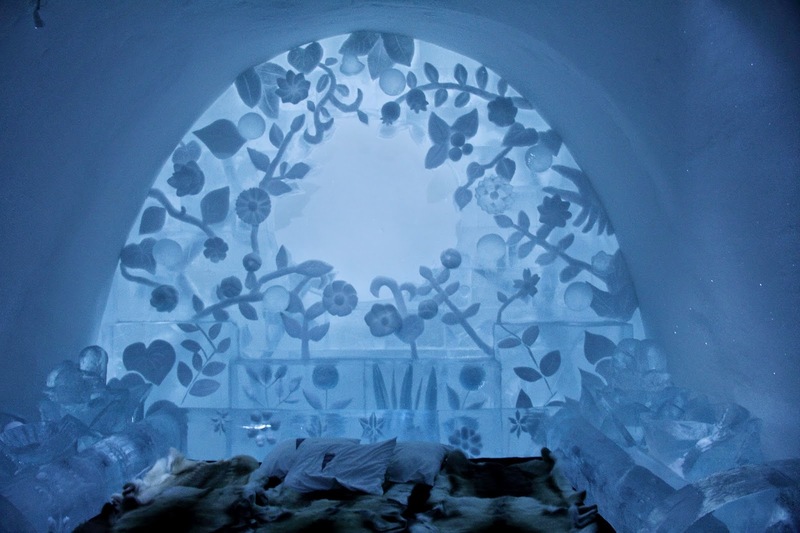 Well, Jukkasjarvi is the town that hosts the wonderful Ice Hotel in Sweden. The town is home to over about a 1,100 people and 1,000 dogs. Any place with so many canines has to be high up on my list! The Ice Hotel is painstakingly constructed every winter and throws it’s doors open to tourists to come and visit or even sleep within the icy interiors. While there are ice hotels constructed in Japan, Norway, Romania and Canada now, the first ice hotel to ever take shape was that in Jukkasjarvi. It was a nice feeling to be where it all started. But as we were seeing an ‘ice building’ for the first time ever, we would have acted like excited little kids regardless of the location. Its a hotel made of ice… just ice… doesn’t that sound exciting? Let me correct myself, its a hotel made of ice and snice and some steel rings at a few places. Around 100 people are involved in the construction of the Ice Hotel. Half of these are artists who are especially invited to design the lobby, art suites, sculptures etc. The concstruction of the hotel is done using over 1,000 tonnes of ice taken from the Trone river and over 3,000 tonnes of snice which is water in a state that lies between snow and ice. Snice acts like the conventional mortar and does the job of cementing the structure. The hotel is open between December and March. The nearest rail and air base from Jukkasjarvi is Kiruna. 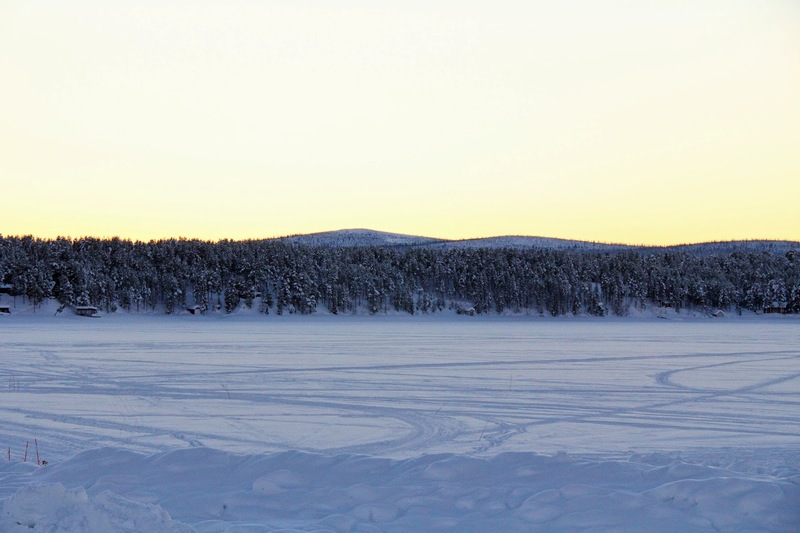 We landed a Stockholm and then took a connecting flight to Kiruna, which lies on the Northern side of the Arctic Circle. We clapped like kids when the pilot announced in flight ‘We are now crossing the Arctic Circle’! Small joys of ticking items on the bucketlist! 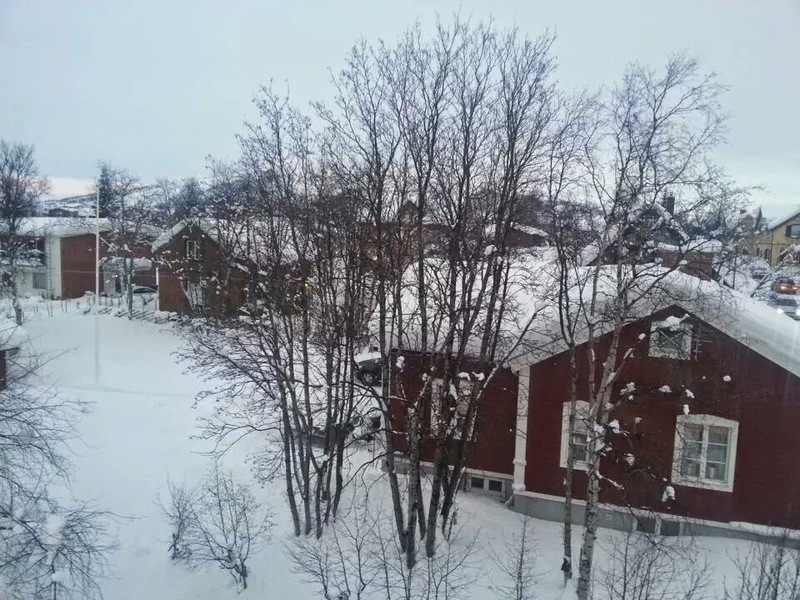 We spent a night in a B&B in Kiruna with a local – Hans Oloff. Hans is a Sami (natives of the Arctic Region) descendant and is professional photographer. It was great to interact with him and his family and watch the collection of his pictures. I had carried some Indian spices for Hans. I fixed a quick dinner with Indian gravy and we all enjoyed it on a lovely table that had colorful tulips! Joys of meeting people as you explore the world is the highlight of our trip – always. Hans was kind enough to drop us to the Ice Hotel – a 17 km drive. On our way back, we hopped on a bus that connecting the two towns. The Ice Hotel offers warm and cold accommodation. The warm accommodation is regular rooms/chalets that are well heated and let you stay close to the ice hotel and still not feel the icy chill. 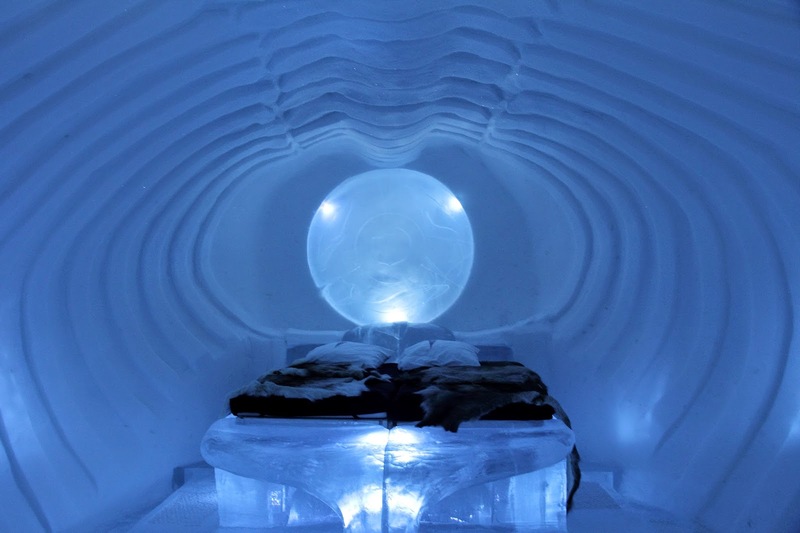 If sleeping in a room made of ice is on your bucketlist, then the cold accommodation is meant for you. There are the snow rooms, with beds made of ice and plain walls – a little boring. 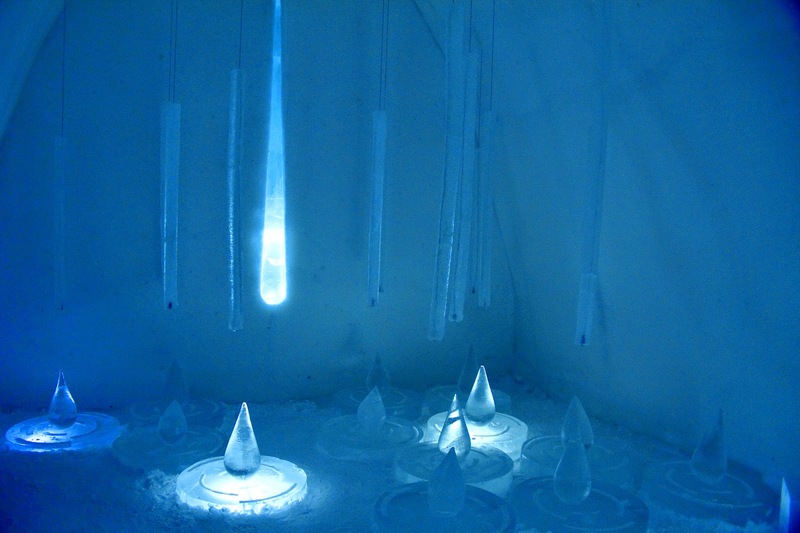 In the next category are the ice rooms, which have furniture made of ice along with the ice bed. Then there are the art suites and deluxe suites, with ice furniture and ice sculptures that will leave you in a state of awe! 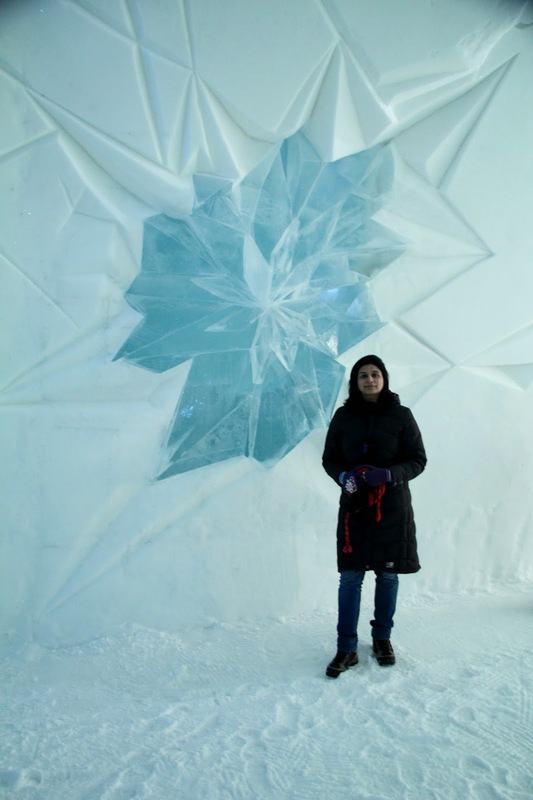 Every art suite has a theme on which it is crafted by some notable ice sculptors. There are also the Northern lights rooms – watch the light effects as you lie on a bed made of ice, comfortable in your sleeping bag. All the ice beds have reindeer skins to sleep on, that do not let the cold seep into you. The high calorific value of alcohol keeps one warm. Anyone and everyone needs to take a swig in the Ice Hotel, whether it is for the joy of drinking in a glass made of ice, or just to talk to the bar tender over an ice table or survival – to keep oneself warm and cozy! We highly recommend having a drink at this place so that you can stop and take a breath (and seat yourself on the ice sofas) and marvel at the creations! Just visiting: You don’t need to stay in the Ice Hotel to see the rooms and the creations of the artists. The Ice Hotel is open to visitors during the afternoon. Please check the hotel website for exact timings. You can explore the art suites, sit on the ice bed and click as many pictures as you desire! Souvenirs: There is a small souvenir shop, where you pay for the entrance ticket to enter the hotel. We did not find the Ice Hotel magnets anywhere else in Sweden except here. You will get a little pamphlet that gives details of the art suites and the a snapshot of the artistes inspiration. Transport: Bus number 501 plies from Kiruna to Jukkaskjarvi and back. Check for exact timings. The bus stop is right next to the hotel on the main road. You can also hire a cab to get to the Ice Hotel. Renting a car gives you the maximum flexibility – just be sure than you can drive on snowy and icy roads. Dress well: And I don’t mean dress well for a party! Layer yourself well. You will spend all your time in a sub zero environment. It is warmer inside the Ice Hotel than it is outside. When we were waiting for our bus, it was -15 degrees Centigrade (while inside the hotel was -5 degrees Centigrade). Sleepy time: If you intend to stay in the Ice Hotel and are allotted reindeer skins that do not smell too pleasant, ask for a change. The staff is happy to oblige. We did not spend the night here. The thought of sleeping on a bed made ice makes my feet cold…even as I am typing this! Loos: There will be no bathroom inside your room in the Ice Hotel. So, ensure that you do what needs to be done before you warm your hands and feet in your sleeping bag. Else, to attend to Nature’s call, you will have you get out of the sleeping bag, wear your layers, walk through ice and snow and then take the effort to warm yourself again! Bucketlist item: If you have the money, staying in the art suites is a must do! However, we were not to enthused by staying in the simple snow rooms. However, if staying in the Ice Hotel is a bucketlist item and you are on a budget, this is your best bet. Glad that you enjoyed the post. Had a great time in Sweden. I still need to write on Stockholm…. Great post; LOVE the photographs! Thanks Aradhana! 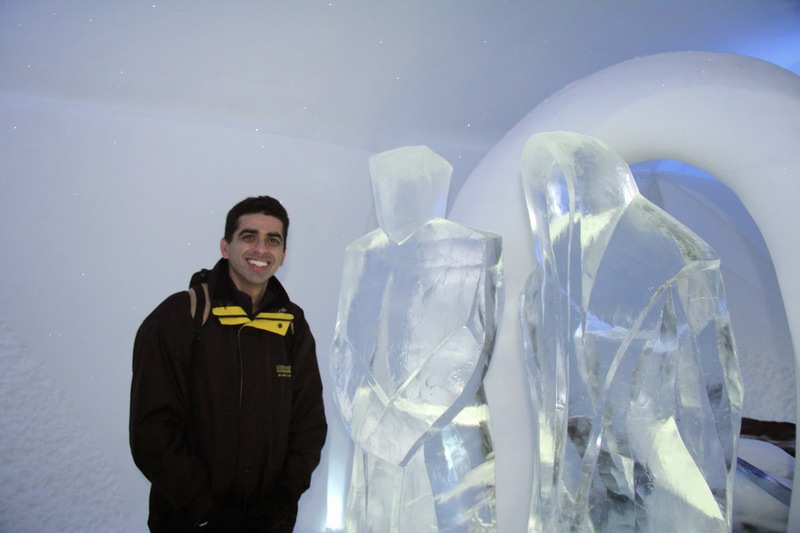 I wish I could convey the chill and the feeling of being in a room made of ice and snow… Must experience at least once! WOW Sonia! Enjoied reading. You have penned it really well. Keep going! Thanks Neha! Glad you enjoyed it…you can follow the blog…lots more coming up! This also looks very cool! Very keen to do this now after reading your post! Hey Tim! 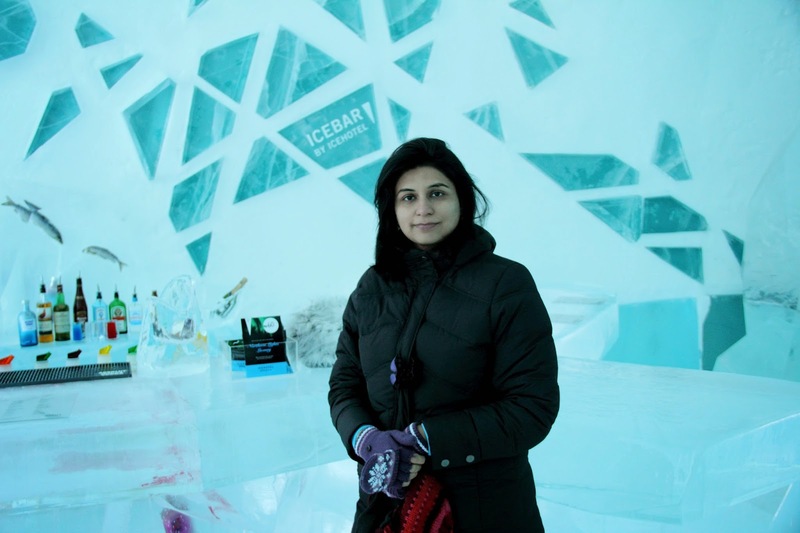 The Ice Hotel deserves a place in every traveller's bucketlist! Add the joy of seeing the aurora borealis! I am so late reading your posts(by over a year), but love them I must say! Glad you liked the posts! The entrance lobby looks already so great but the further I scroll through your post, the more magnificent it becomes. this is truly beautiful! I have heard already quite a lot about this hotel but had no idea, how “cool” it really is 🙂 Great inspiration, was fun to read! Oooo an ice hotel! This looks absolutely breathtaking! Was it really cold inside? My feet are always always cold and I don’t know if I could fall asleep in a hotel made of ice! Oh this sounds incredibly cool! (no pun intended!) I love the idea of staying in one of the ice room suites. I will take your advice on the reindeer skins and doing my business prior to going to sleep though as I take forever to warm up. It would be such a thrill to go to the original ice hotel. They are popping up everywhere now, but seeing the original would be incredible. No question – the ice hotel is a work of art. You could only imagine the amount of work put into carving the ice to build this structure. And the bar, as well as other features within the hotel, they are so perfectly done that it would be hard to fathom they are all done in ice. You are so lucky to have tried this experience that I wish I would get a chance to someday! You are so right about many people having heard about ice hotel but not knowing Jukkasjarviice. I too had heard about the hotel but did not know it in detail as i now know thanks to your detailed blog. Spending a night here is definitely on my bucket list. I already feel cold just by reading this one. How can someone sleep inside an Ice Hotel, that too in Winter. I would have loved to see some exterior pics as well just to see how it looks form outside. I have heard of the Ice hotel before but never heard of the Jukkasjarvice like you said. I don’t know, sleeping on reindeer skin doesn’t appeal to me that much. And you have to go outside for the loo. Maybe I will just visit the place rather than stay there.